Shaped to fit securely around the nose and mouth, this mask offers enhanced comfort and breathability. The mask provides protection from the wearer to all individuals around the wearer. 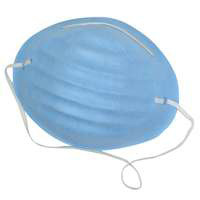 Other surgical masks are recommended to provide protection to the health-care worker from others. This mask is fiberglass-free and has an adjustable nosepiece for a comfortable fit.